Villa Magdalani is a luxury family villa offering a high standard of accommodation in a peaceful setting within the beautiful Greek village, Lourdas. It is a well equipped, family villa facing south to the Ionian sea and the Island of Zante beyond. The villa has air-conditioning and central heating throughout, ideal for a relaxing holiday all year round, or for the more energetic there is table tennis and a 9 x 4m swimming pool. Situated at the bottom of Mount Aenos, it is a wonderful place for walkers and hikers, bird watching or watching the sunsets. 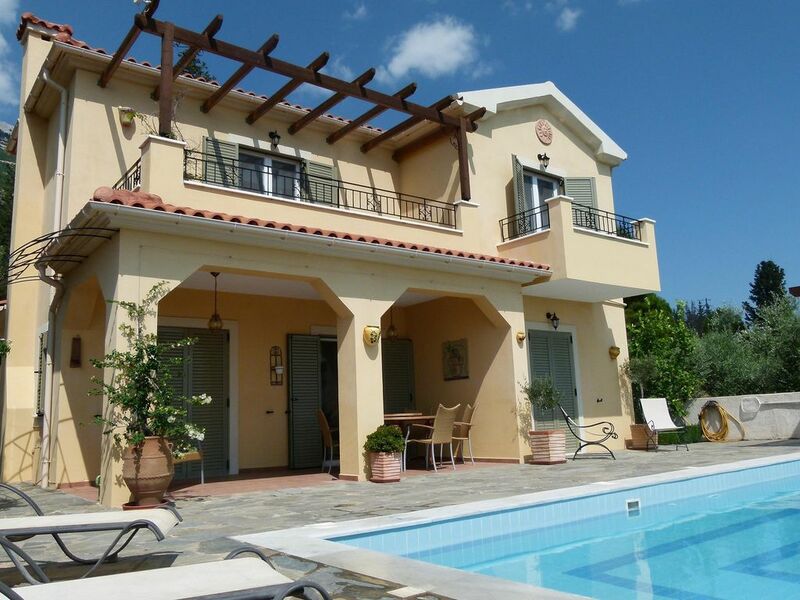 Villa Magdalani is ideally situated for exploring the whole of Kefalonia. Argostoli, the capital bustling cosmopolitan town is 10km away. A car is not essential but recommended. The village has some wonderful restaurants and tavernas within walking distance. Luxury en-suites to all bedrooms. Twin bedroom and ground floor bedroom bathrooms with shower enclosures. Master bedroom has a bath in en-suite. Also cloakroom on ground floor. There is a fully fitted kitchen with hob, built in oven, large fridge/freezer, microwave, toaster, dishwasher and coffee maker. All utensils provided. 2 high chairs available on request, children's beakers/plastic plates provided. Dining table, 6 chairs. The villa, drive and pool patio are all on level ground with a ground floor bedroom with en-suite shower enclosure. There are steps that lead from the patio into the pool. Notes on accommodation: A complimentary food pack containing a few essential items is provided. A guide/ Map of Kefalonia and information about the villa and surrounding area will be sent out with your balance receipt. There is a selection of books and games and CDs/DVDs to keep all ages entertained. Outside: The villa has a 9 x 4m private pool. The pool patio has 6 sun loungers with a shaded pergola and barbecue. A large round teak table with a Lazy Susan and chairs for 6 is under the covered terrace. Borders and flower beds on both sides with gates leading to a large drive for 2 cars. Utility Room: Washing machine to be found in downstairs cloakroom with iron/ironing board. Cleaning / Towels / Linen / Maid service: The villa is cleaned on changeover day and again during the week. The linen/towels are changed on these days. Beach towels are not provided. Second stay at Villa Magdalani, still beautifully kept and looks new. Everything you could need from great bbq and wonderfully equipped kitchen. Secluded spot with awesome views of the sea and the mountains. Table tennis was great in the high heat as covered. Will be back! A really first class villa that has everything you could need for a great holiday. Less than 30 mins drive from the airport and spotlessly clean with a generous welcome pack. Loads of excellent bars and restaurants within walking distance and Lourdas beach is great. A car is recommended to cope with the hills in the heat plus to get around the beautiful island. Owners a pleasure to deal with and have loads of helpful information and tips. If you are looking for a brilliant villa to enjoy a great holiday you have found it. Lovely villa in a quiet but not isolated position and the view was far better than expected. The villa was very well equipped with more than enough tableware and cooking equipment and everything clean and modern. Villa Magdalani has a beautifully maintained garden that surrounds all sides meaning there is always somewhere to sit in sun or shade. There was a variety of different seating and loungers and the table tennis table is fun to use. Lourdas is a reasonably short walk but quite a steep walk up from the beach, which I imagine would be a struggle for some, particularly in the main summer months. Lots of nice restaurants and small supermarkets within a short drive and some walkable distance. Parking was easy at the beach when we were there in June but don't know what it would be like in high season. After being a little bit apprehensive about booking direct with the owners, I needn't have worried. Jo and Darren made the whole process straightforward and I would thoroughly recommend Villa Magdalani. I would have no hesitation in returning to this property if visiting Kefalonia in the future. Thank you. Well presented property with amazing sea views. Great villa with amazing views, short walk to local tavernas. Good sized pool and patio, the table tennis table was a real hit with our children ! Much nicer to stay in a family owned property as it always feels more homely. Would love to visit again had a brilliant family holiday. The villa, it's setting and views, the pool and outside areas are first class. It is also extremely well equipped, clean, bright and the table tennis table is a bonus. Watching the sunset from the balconies is something not to be missed. There are lots of taverns within walking distance and the mini markets and bakers have everything you might need if you're bar b Q ing or eating in. A car is useful not just for getting shopping up the hill but to explore this lovely island, but as long as your relatively fit it's not essential. The neighbours are also very nice, but not at all intrusive and have helpful suggestions about places to visit and how to get there. They also gave us a jar of homemade apricot jam! The owners are very quick to respond and helpful. Famous Lourdas beach is one of the largest bays on the island and is fringed by over 2 miles of sand and pebble beach and 500m down hill. Trapezaki beach with its sandy coves is 1km away and can be easily reached by car in 3 minutes. The village faces south so gets all day sun! The airport is 20 minutes drive away but no aircraft noise is heard from the villa. Car hire is recommended to see this beautiful island but not essential. Argostoli, capital is 10km, St George's castle is 7km towards the town. Sami where captain Corelli's mandolin was filmed is 25km also Drongarati Cave, and Melissani Cave Lake. The Cephalonian Robola wine visitors centre is at Valsamata 20 minutes away. North of the island is Fiscardo with its fine yachts and very Greek village of Assos, all within a days trip. A ferry can be taken from Sami over to the Island of Ithaca for the day. There are several local shops/supermarkets in the village. There is information in the villa on tavernas/restaurants and places of interest in the area and on the island. The village has 2 internet cafes and banks are located in the main town of Argostoli. Booking Notes: A booking form and terms and conditions can be sent on request. A £250 deposit per week is required to confirm a booking with the balance to be paid 8 weeks prior to departure. A £200 returnable deposit is taken with balance and returned within 14 days of return. This Villa has been inspected by the EOT Greek licensing association. The number is M.H.T.E 0830K10000818301 03/02/2010 Changeover Day: Changeover is preferable Sunday from May - October otherwise flexible, please contact us. Arrival after 3pm and leave by 10am on day of departure. Notes on prices: Prices are for the villa per week in UK pounds.